After A Week Off, The Stars Try To Knock The Rust Off. Your Dallas Stars are no longer the best team in the league. They are no longer the best team in the conference, either. They're not even the best team in their own division any more. Mathematically, yes, they are still very much in the hunt. But having only one win in the last seven games does not bode well for a playoff appearance, folks. Management must decide now if it's time to tank in order to secure a higher draft pick, or if they're going to play out the season in hopes that they can miraculously make the playoffs. Sike! That's Dallas Cowboys talk. Did you forget that the Stars have an actual GM? Jim Nill might not win such dubious distinctions as “General Manager of the Year” like ol' Jerry, but it don't matter none. We dem boyz! Yes, the Stars have played like boo-boo over the last two weeks, but sometimes that happens in an 82-game schedule. So stop your cryin' heifer, I don't need all that. Let's take a look at the two games the Stars played last week, and then see what's coming up this week. Another five-day break possibly? • Darkness Music at Anaheim Ducks, 2-4. Not even all the CLR from all the Home Depots in Frisco could've helped your Dallas Stars skate off the rust in this match. Last week, we all agreed that the loss to the New York “Values” Rangers was the worst game of the year — but, unfortunately, we have a new candidate for that title. From the opening faceoff to that merciful final buzzer, Anaheim owned this game. Outshot, outhit, outworked for outhouse results. When Travis Moen is your best player, things aren't going well. Let's not dwell here. • Loser Point at San Jose Sharks, 3-4 (OT). The Stars took a one-goal lead into the first intermission thanks to the work of Ales Hemsky's “checking line” after the team was largely outplayed in the period. San Jose had lost every game at home if they were scored on first up to that point. Got damn, that was a terribly written sentence, sorry. Anyway, the Stars showed steady improvement in the second and third periods, amazingly figuring out how to exit their own zone and complete passes to teammates. Some confidence-building work there, but our heroes were unable to hold off the determined street Sharks, who would go onto win the contest in overtime. The highlight of the night was this marvelous spin-o-rama goal from the top of the circle by Spezza. Oh, me likey! 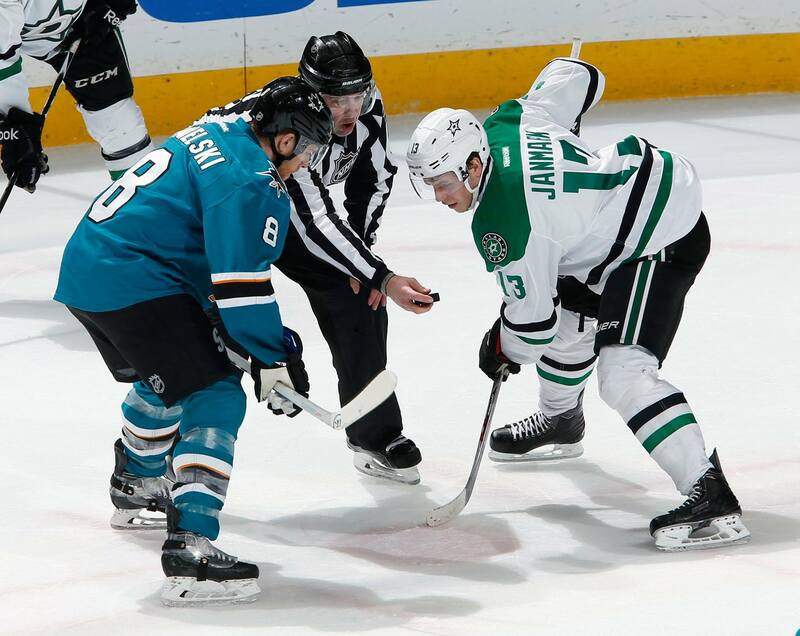 Mattias Janmark has been a pleasant surprise for Your Dallas Stars this season. The Stockholm native was acquired by Jim Nill in the the Erik Cole trade late last year with hopes he would make the NHL in the near-distant future. But a strong training camp in September convinced the coaching staff that the Janmark era begins right here, right now. He boasts excellent two-way play and skating ability with an understated offensive flair; squint hard enough and you can see traces of Jere friggin' Lehtinen. This kid is going to be second-line center great, folks. You heard it here first. The Stars wrap up their California road trip against a tough Los Angeles Kings squad on Tuesday. Led by Anze Kopitar, who is motivated by ongoing contract extensions talks for beaucoup money, the Kings will be a terrific challenge. Look for a very physical contest that will come down to goaltending (sideways frown face). On Thursday, the Oilers spill in Dallas, followed by an Avalanche on Friday — two underpowered teams the Stars would love to get a couple wins from. Also, Walmart has $76 billion in undisclosed overseas tax havens. P.S. For everyone that tuned in last week, allow me take you back to our sweltering trip down to the Mike Modano exhibit at the Texas Sports Hall of Fame. In short: Mikey Mo's exhibit wasn't worth driving to Waco for, but the feeling of relief after leaving Waco is. Shout out to all my Baylor WASPs!